We help businesses communicate effectively and stand out in the media … for all the RIGHT reasons! Our highly effective in-house media and presentation training courses in London and beyond have polished up the communications skills of hundreds of people, right up to CEO and board level, from a range of organisations—large and small. You’ll get personal service from us; every course is tailored to your organisation’s specific requirements. Course Director Tom Maddocks is a former BBC2 ‘Money Programme’ reporter and is recognised as one of the UK’s leading media training experts—as quoted in The Sunday Times, the FT, The Independent and many others. 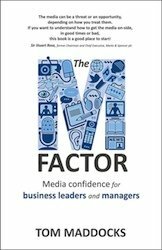 He is also the author of The M-factor: Media Confidence for Business Leaders and Managers. Let us give you complete media confidence! Our print media, radio and television courses give you plenty of practical interview experience and show you how to get your message across; what will (and won’t) interest the journalist; how to deal with difficult issues; and the essential questions you should ask before agreeing to any TV or radio interview. As well as our standard media training we can provide crisis media training courses. These will help you turn the media into part of the solution, not the problem, should disaster strike. We work with you to create a relevant crisis scenario then base the training and interview practice around it. We specialise in presentation skills training at beginner or advanced levels, to banish your nerves and make sure your message really gets across to the audience—be it a key client pitch or a large conference. We can hold specialist one-on-one coaching with senior executives—ask us for details. 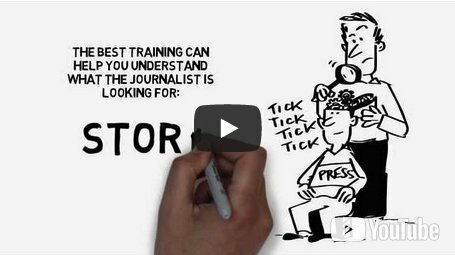 What is Media Training, and how can it help? Are your company’s decision-makers unconvinced of the benefits? Request a copy of our report on ‘Making the Business Case for Media Training’. Tom delivers a refreshingly forthright and highly practical approach to engaging with the media whether in good times or when a crisis hits. Running media training for senior leaders in our sector, Media Training Associates has been a real hit. A three-month high-level personal coaching programme with Tom Maddocks for senior individuals to build their presence and improve their ability to communicate and persuade. It includes three half-day coaching sessions, covering: media training, presentation skills coaching, and expert help with body language, vocal skills and messaging. Plus three one-hour telephone coaching slots with Tom, and access to our ‘media hotline’ for emergency interview practice. Don’t be afraid to move the interview topic forward if a reporter seems to get bogged down on one issue. Without exception, everyone who has attended the training found it extremely useful and enjoyable. 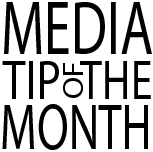 From our most self-assured media spokesperson to those who are new to media relations, everyone has come away from training with a greater understanding of the media and feeling of confidence. Create impact and make the right impression in front of the people who matter. Using practical exercises that fully involve those taking part, we will work on posture, the authentic use of gesture, standing, and movement. Voice coaching will teach you how to project your sincerity, vision, passion and motivation. This is a half-day specialist course run in-house for a group of up to three people or as one-to-one coaching for senior executives. Journalists always want a good quote so think carefully about how to make your point in a punchy, pithy way. Avoid that ‘rabbit-in-the-headlights’ look. This specially-tailored half-day in-house course will help you look natural and professional in corporate online video and webinars. We provide a teleprompter facility as part of the package so you can get realistic practical experience and help to establish a style that works for you. The course is suitable for one-to-one coaching or a group of up to three. Fantastic morning giving insights and practical experience in dealing with print, radio and TV journalists… great delivery, real experience, valuable insights, highly recommended. As with any speech or presentation, even if you only have to speak for between two and three minutes, you have to structure your material effectively so it will flow—and you have to rehearse.